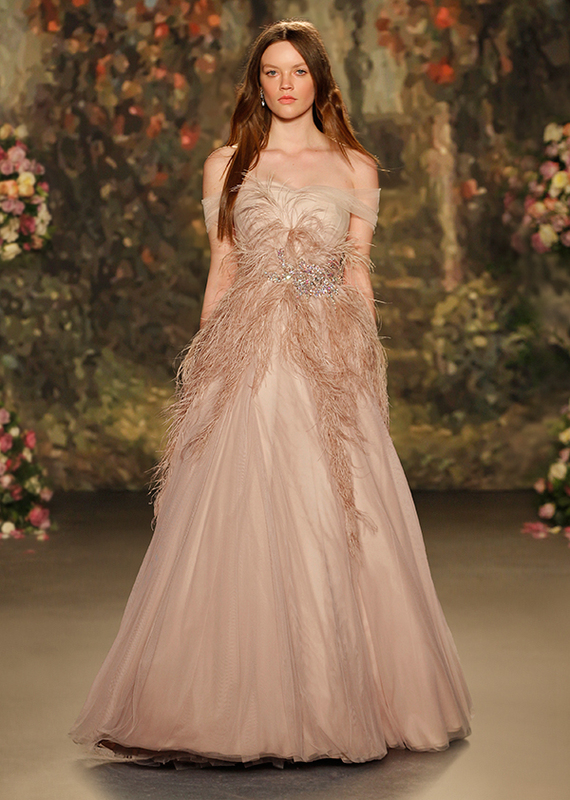 A gorgeous off the shoulder tulle wedding dress with ostrich feathers and stunning Swarovski crystals. 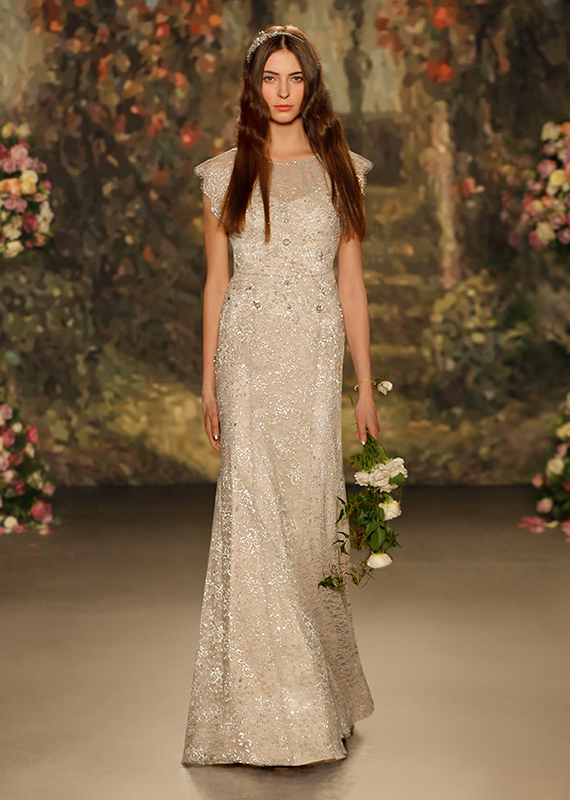 Romantic wedding dress with delicate crystal floral pattern. 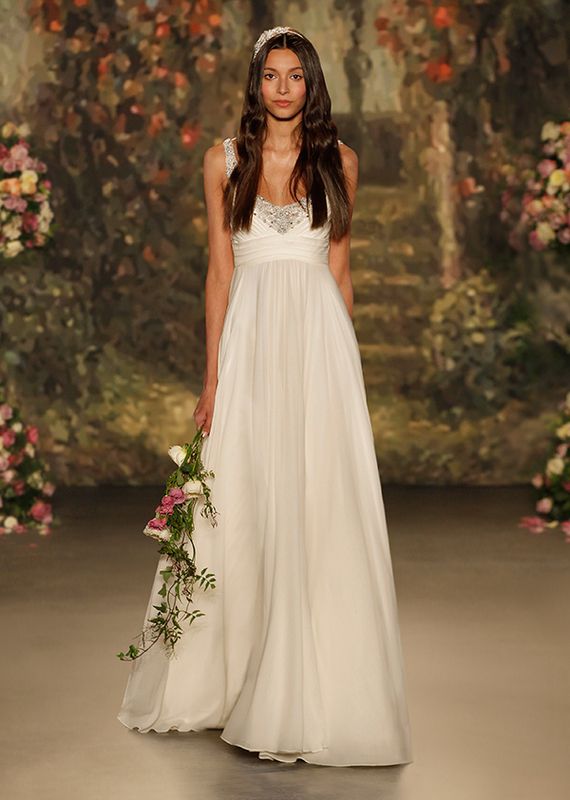 A beautiful a-line silk wedding dress that features an elegant v-neck. 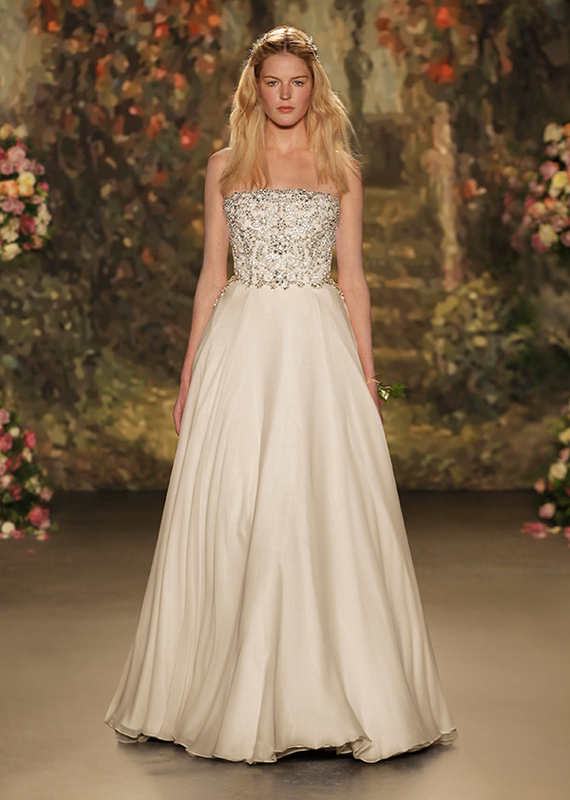 I love the beaded bodice! 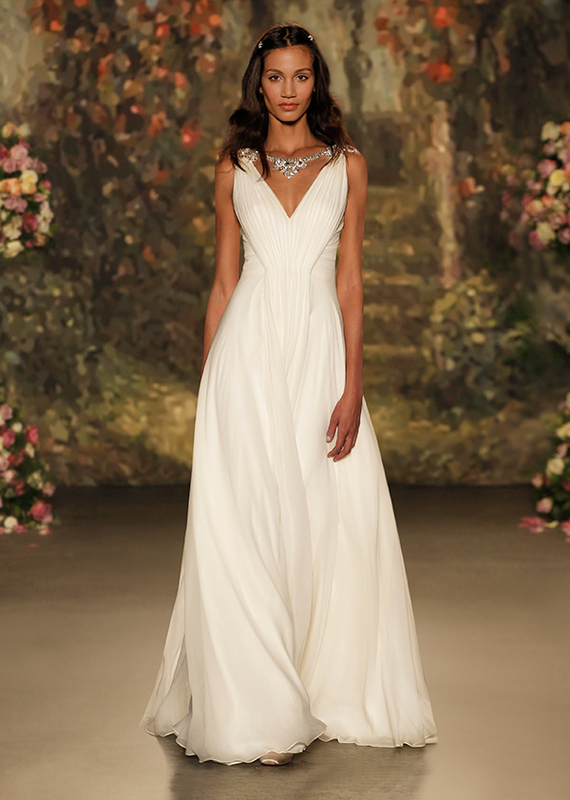 The silk pleats add just the right amount of sophistication to this elegant a-line bridal gown featuring an attached jeweled necklace. 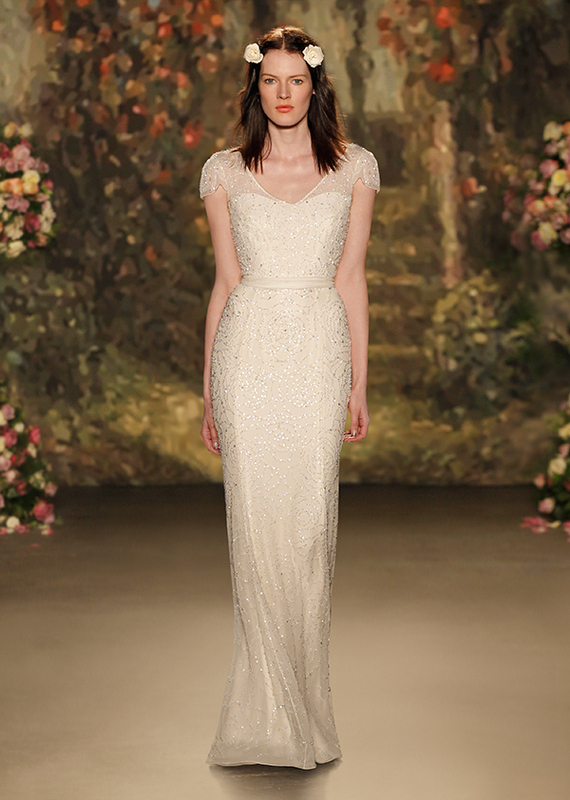 Lovely sheath wedding dress with intricate beaded details and cap sleeves. 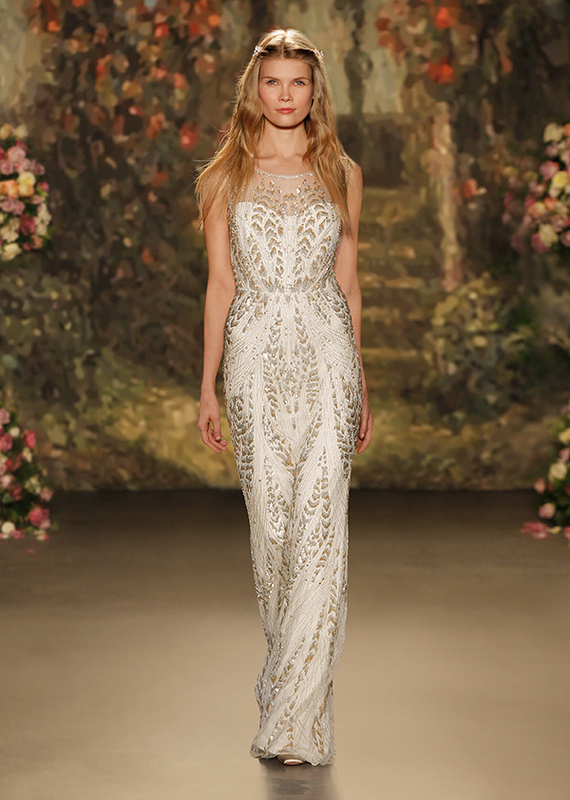 Elegant column bridal gown with a chic chevron pattern embroidery. 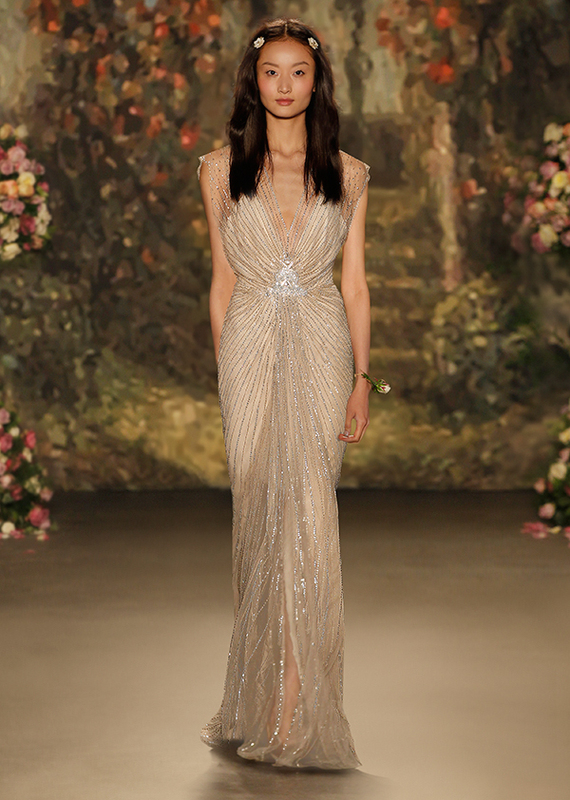 An elegant silk pleated sheath wedding dress with a sheer v-neck adorned with crystals on the shoulders and on the waist. 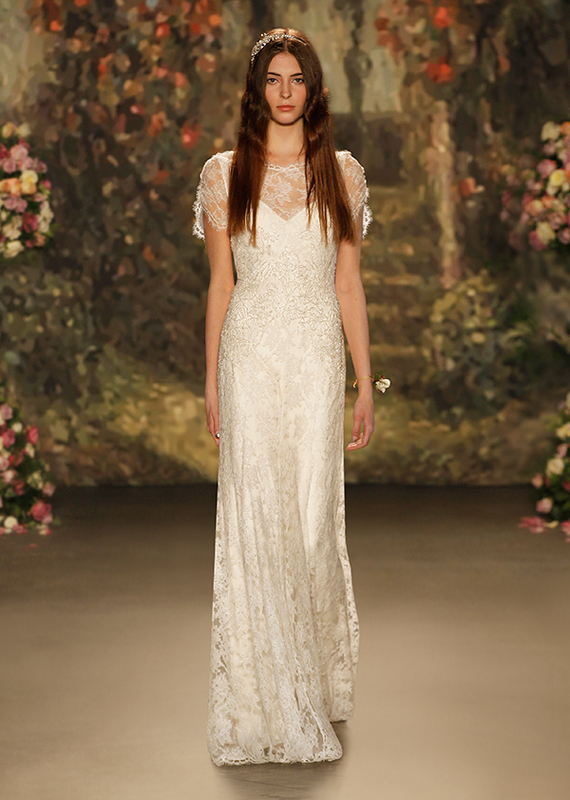 Bias cut wedding dress by Jenny Packham with romantic floating sleeves. 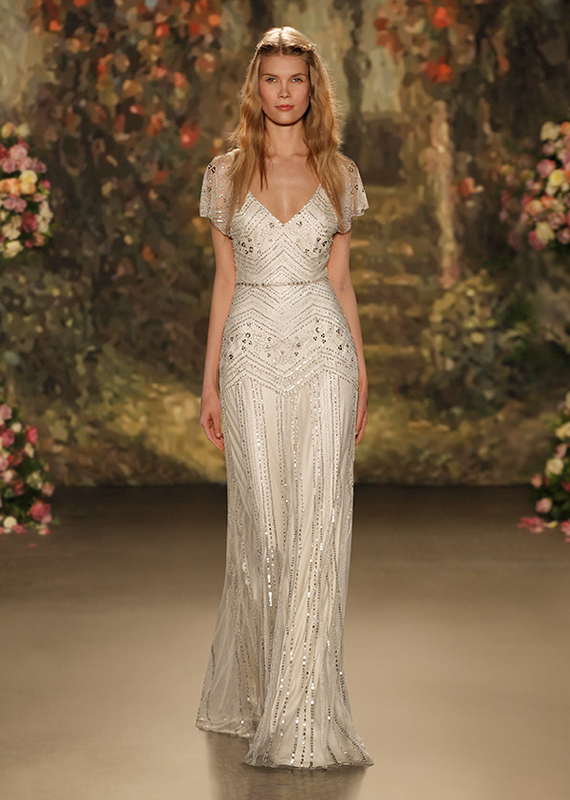 Bias cut wedding gown with caps sleeves and amazingly beautiful beading throughout the dress. 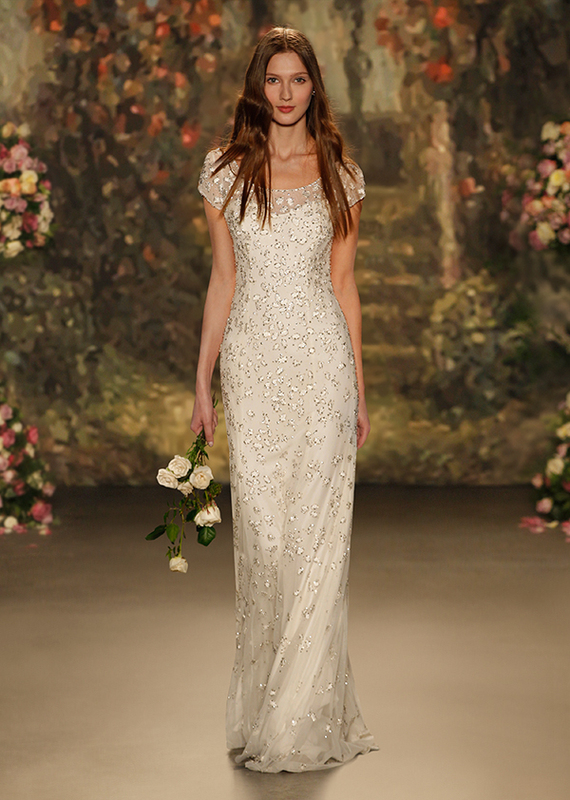 Elegant a-line wedding gown featuring a v-neck and an impressive beaded bodice. 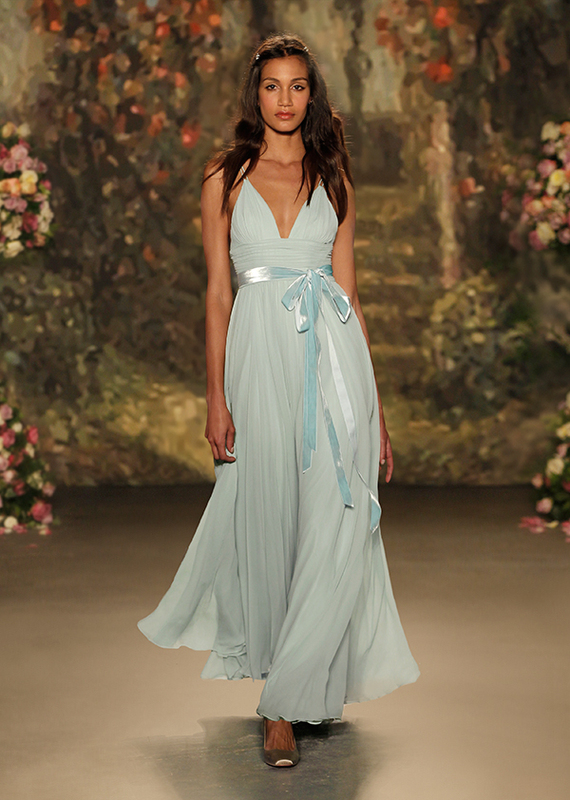 Light blue silk pleated a-line bridal gown with a jaw-dropping plunging neckline. I love the soft blue belt! 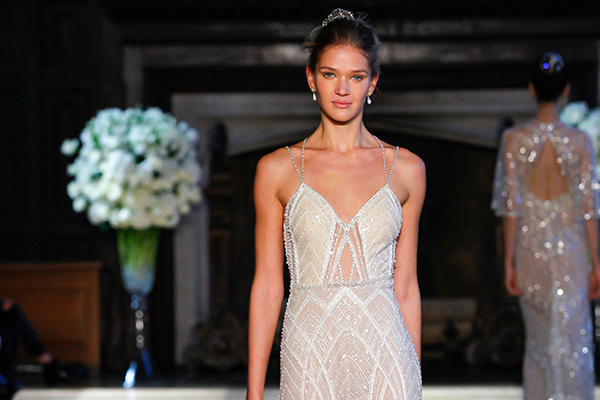 Sheath wedding dress with an incredible beaded design in geometrical shapes. 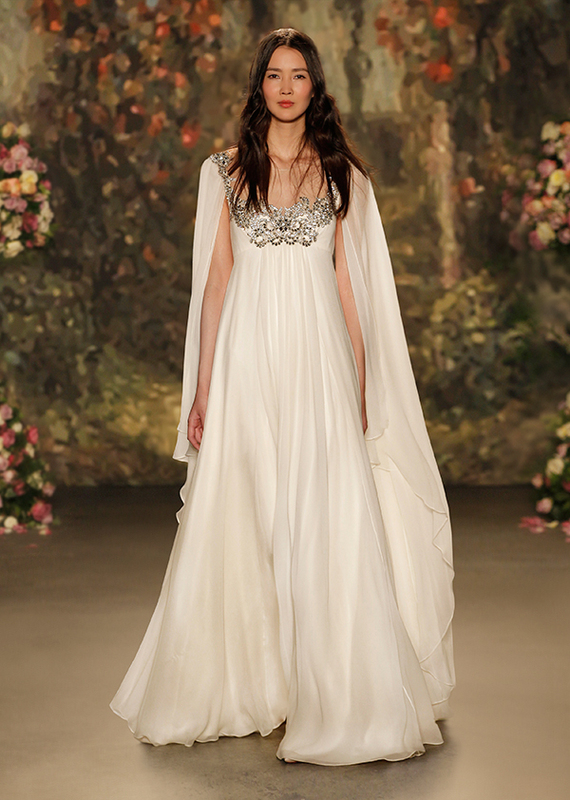 Empire waist bridal gown worn with a sheer cape. 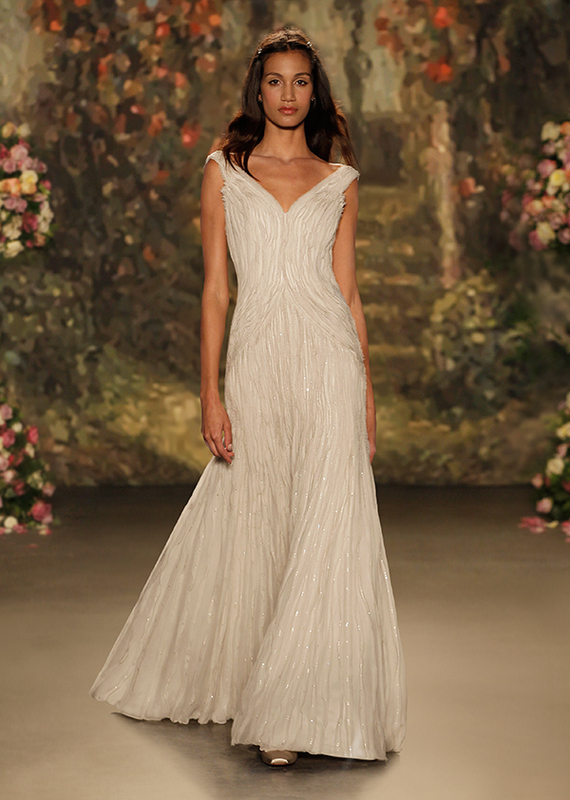 The sheer neckline is beautifully decorated with exquisite crystals. Wedding gown with elegant draped sleeves. 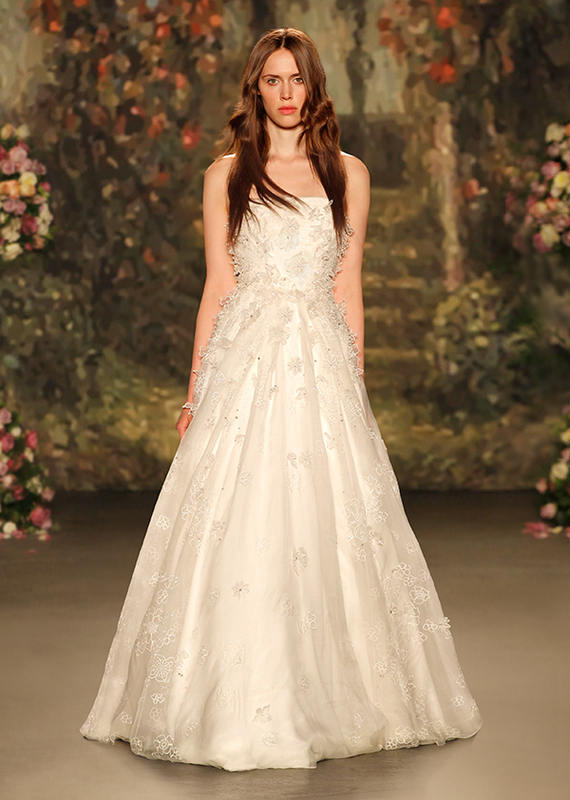 Bias cut wedding gown with silver embroidery and romantic cap sleeves. Sheer elbow length wedding dress. 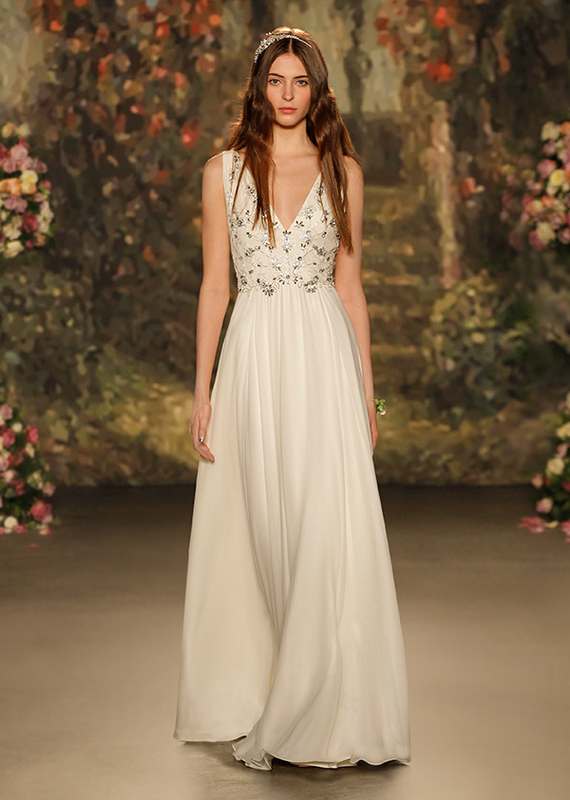 A-line strapless dress with delicate floral appliques. 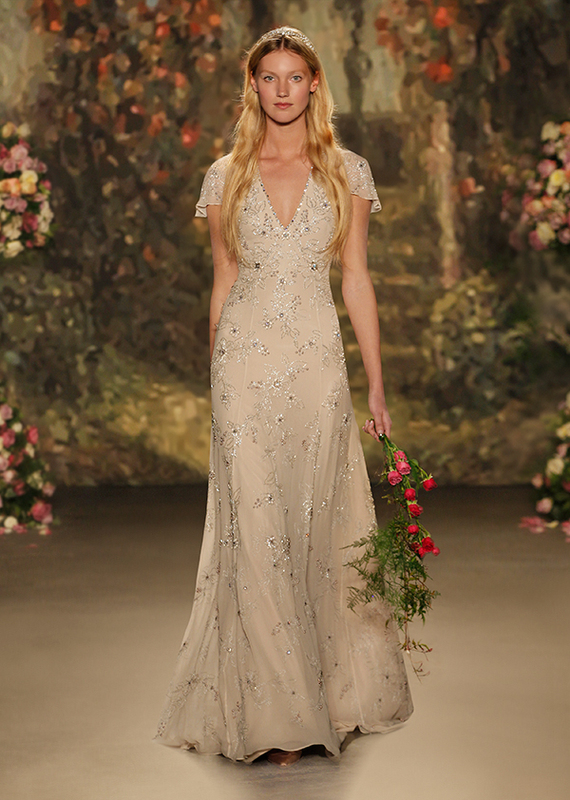 Romantic lace wedding dress by Jenny Packham. 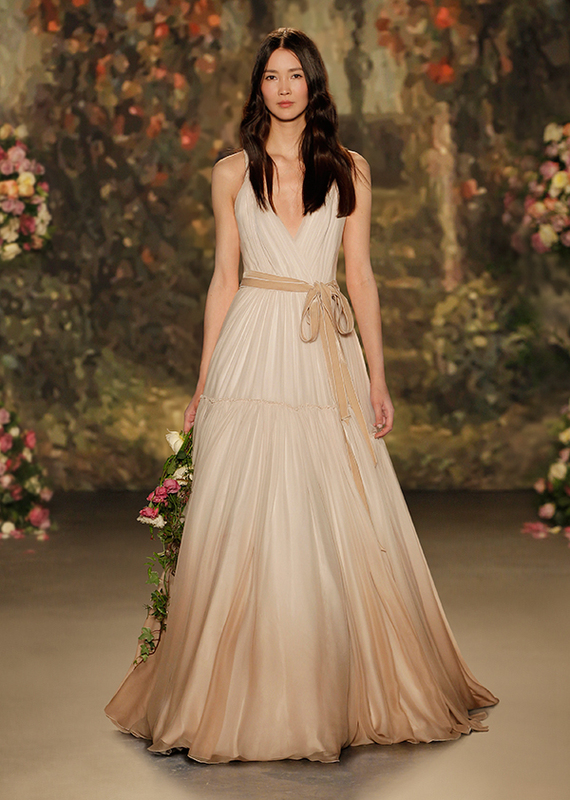 A-line wedding gown with silk pleats and unique jeweled belt. 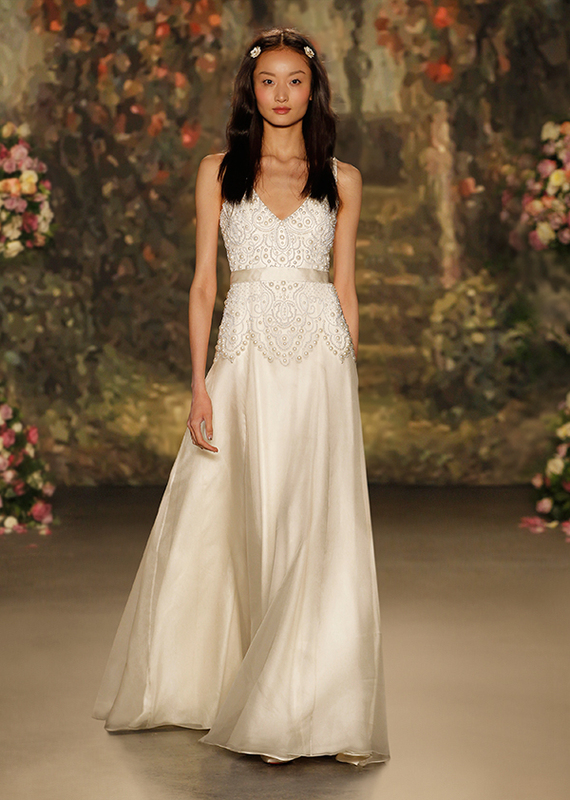 Romantic silk knee length wedding dress with floral appliques. Draped dress with a v-neck halter and wildly beautiful flowers on shoulders. 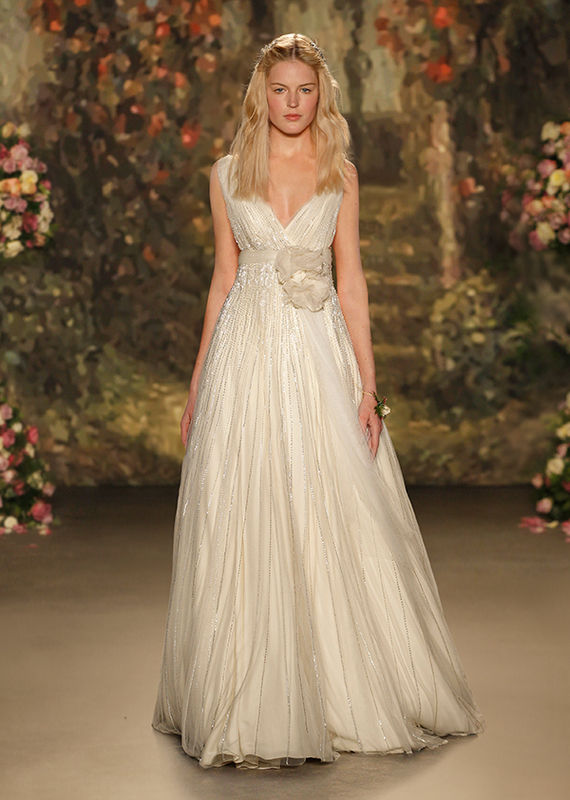 Gorgeous strapless wedding dress with a beaded bodice and flowing fllor length skirt. 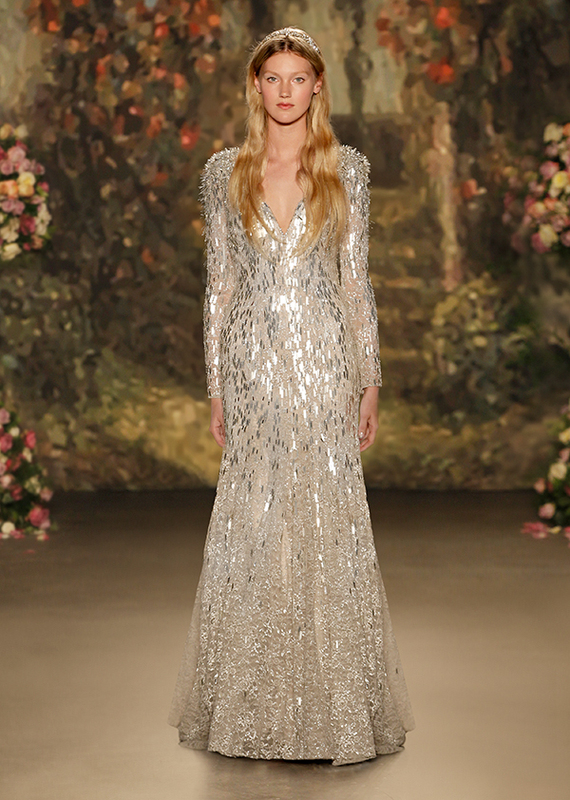 Long sleeve wedding dress with glamorous silver beading. 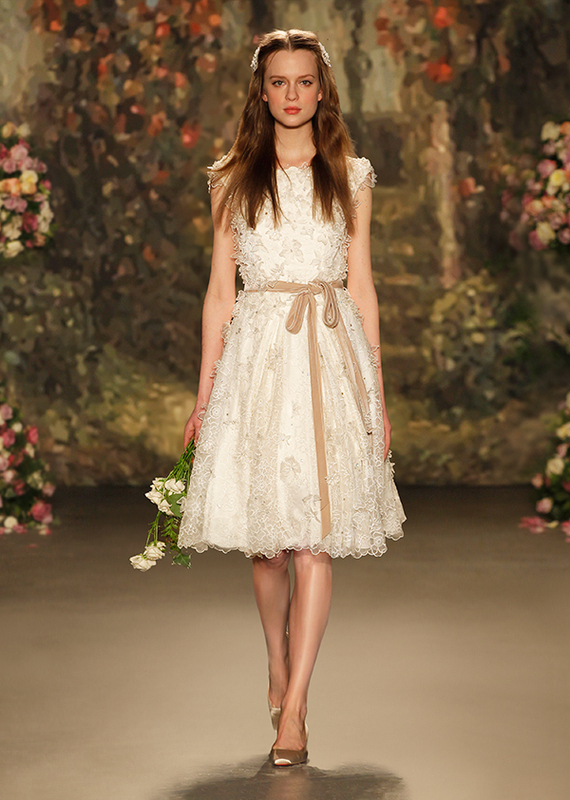 Fit and flare wedding dress with flawless details. 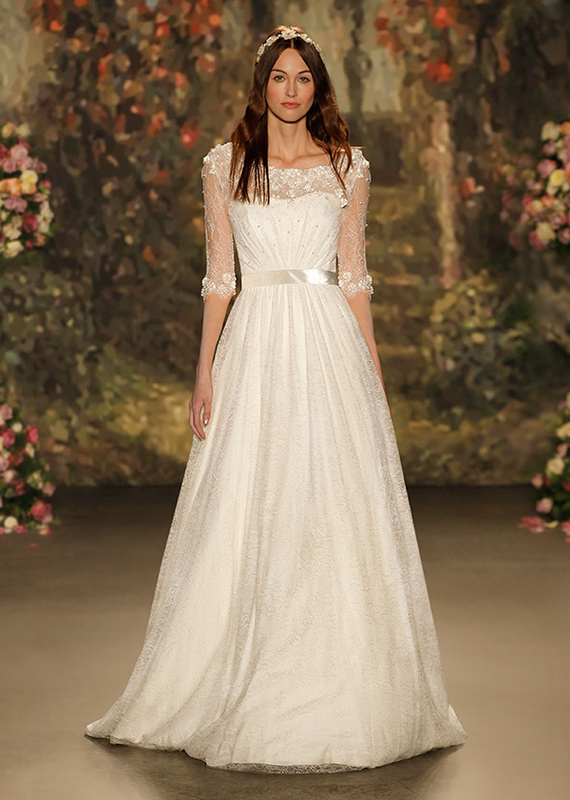 I adore the flutter sleeves on the Hermione wedding gown! 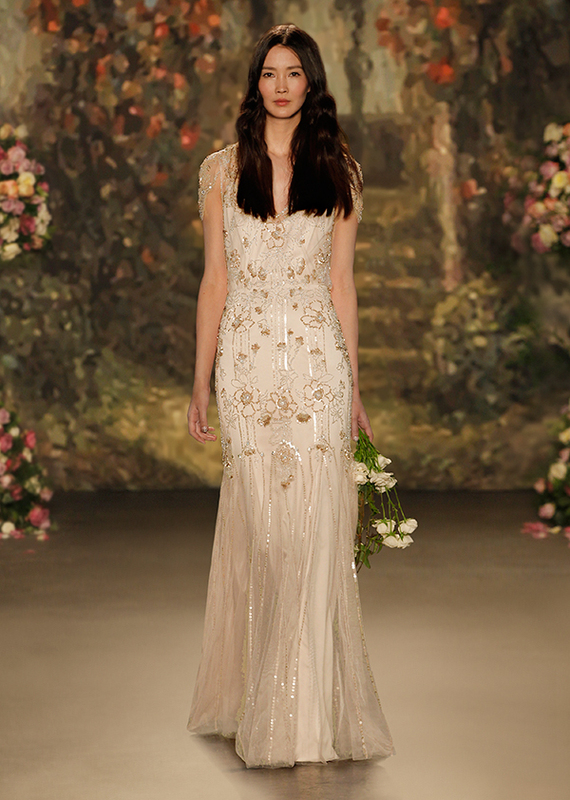 Champagne wedding dress with a beaded overlay. 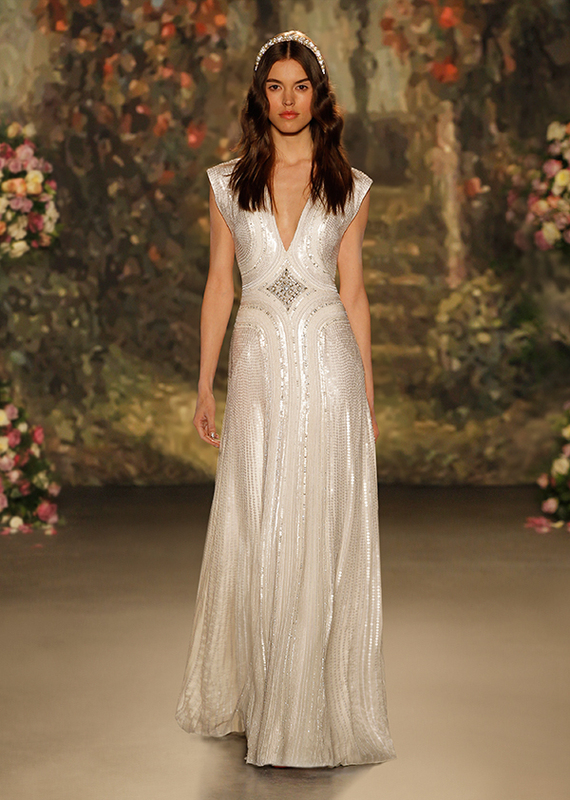 Column wedding gown with a beaded overlay and elbow length sleeves. 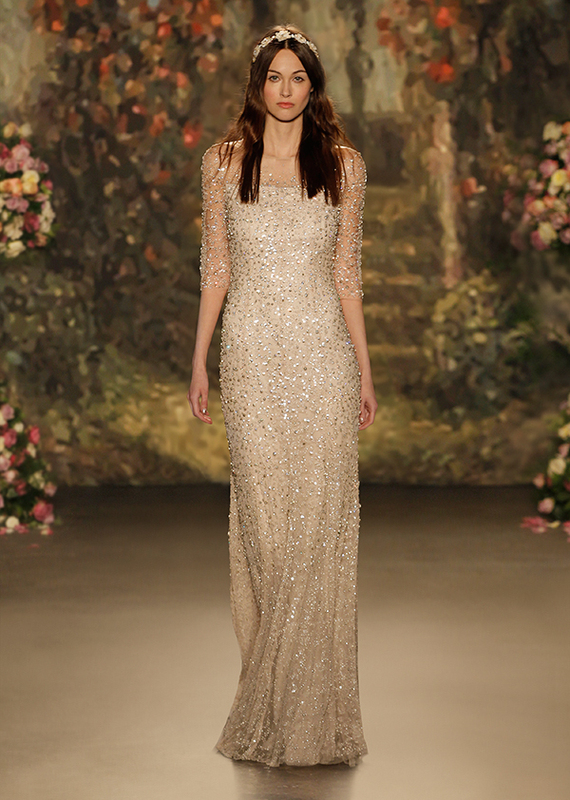 One of my favorite wedding dresses from 2016 Jenny Packham bridal collection: a romantic a-line wedding gown in an ombre style in champagne.